The Daily Draw: 7/10/17—Remembering Who I Am. Again. You'd think, because I've been reading tarot cards for 30 years, that if I ever had an issue I needed input on, I'd just pick up my cards. 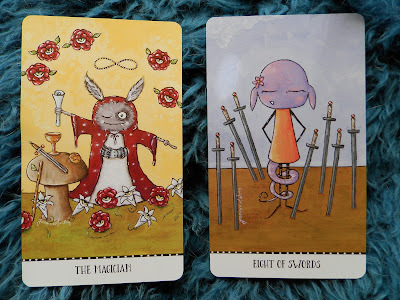 But oddly, it rarely occurs to me until someone says, "why don't you ask your tarot cards?" Anyway, the other night I was on the edge of an anxiety attack over life and FINALLY remembered to give myself a reading. I got the Monstarot deck by Joanna Nelson and Trish Sullivan a couple of months ago and, even though it's preciously adorable, I thought it would give me a serious, but gentle, reading. And it did. It also reminded me of something that I had forgotten. In fact, I broke down and cried. Messages from tarot can do that. The last five years or so have been difficult for me. Just living them has been difficult. I was sick much of the time. Work and my income suffered. I've been pooped on by people I trusted. I have recurring depression. And adjusting to this side of menopause while recovering and rebuilding after illness has been hard. It has been a dark time. A depressing time. A time when I've questioned my will and desire to live. So the other night, a million worries about the future were swirling in my head and I started having some pretty dark thoughts. So I pulled out the Monstarot to calm the monsters in my head. 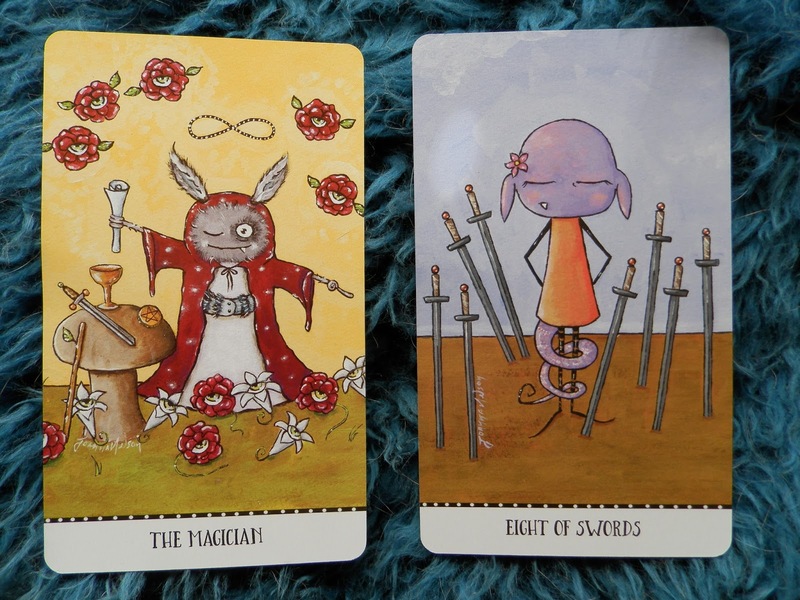 Basically, I asked the cards to tell me three themes that would be prevalent in my life five years from now. And all of that was positive. So then I wanted to see three years from now. Which wasn't as good, but was OK. So then I wanted to see a year from now. Then six months. Then three months. Then three weeks...haha. Anyway, the trend was that the closer we got to the present, the more challenging those three things were. And the further we got away from now, the better they were. So improvement was forthcoming, albeit a little slowly. Then I did a series of one-off questions—you can tell I was in a bad place, because I was being a little obsessive, haha. But then I asked what I needed to know to achieve the best possible outcome over the next five years and ensure as gentle a path as possible. I honestly can't remember the cards I chose, but I think it was the two I pictured. But what I got out of the answer was basically, "Hey, don't you remember who you are? You lost a lot of weight (which I've since managed to find again.) Built a business. Quit smoking. Wrote a book and "invented" a product. Survived an abusive relationship and the murder of your father. Bought a house and filled it with dogs. Succeeded and won many awards in a highly competitive, creative industry. Your life has been a long string of manifested thoughts and dreams. More than that, in a world where most women have a partner's support to help achieve their goals, you did it alone. Remember who you are! You are powerful. You are magic!" Which is a great message to get. But the reason I cried is because I HAD forgotten. And not only that, once I remembered, I realized how long it had been since I remembered. And that made me cry. Because the confidence and faith that had gotten me through all that—the confidence and faith I'd had my entire adult life—had somehow slipped away without me even noticing. I was believing I no longer had it in me. I have a bad habit of forgetting the tools I have available to me. I think depression can do that to you. It's not just the tarot I forget, either. I also forget about my awesome One Better Decision plan that I came up with a while back. (I've actually written a number of posts about it and they are all here.) It has just been a couple of days of doing that and I'm already feeling better. And then, of course, I sometimes forget about about my infinite powers of manifestation. The fact is, we all have a lot more available to us than we know at times of difficulty and stress. Two or three days ago, I was defeated, afraid and having dark thoughts. Today I'm much stronger. So if you're in the same spot, just remember who you are and what you've overcome. And try my One Better Decision plan. Our dreams and our special gifts are too important and bring too much joy for us to abandon them along the road of life. Love this! (Sorry, only just catching up.) I always forget my cards and other useful tools when I most need them, too. Bannerizer made it easy for you to promote ClickBank products with banners, simply go to Bannerizer, and get the banner codes for your selected ClickBank products or use the Universal ClickBank Banner Rotator to promote all of the available ClickBank products.